HP is bringing back Windows 7 "by popular demand"—it's not clear from whom—and making it pretty difficult to buy a computer with Windows 8. Who needs the future when you've got the very recent past? 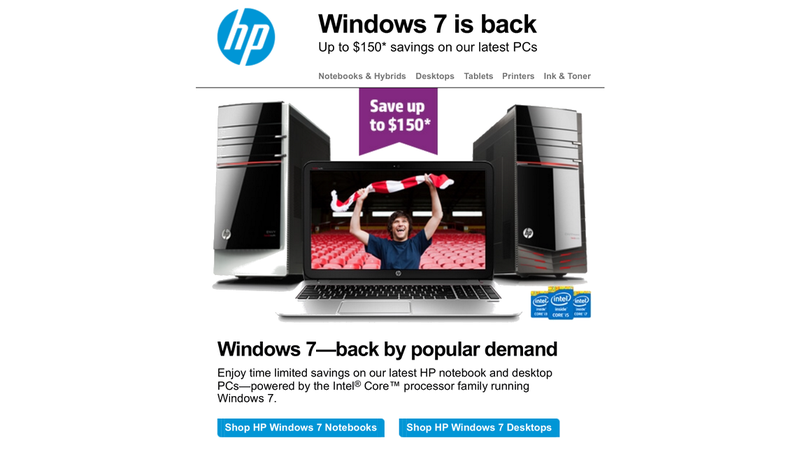 HP sent a boatload of emails out of the weekend, pointing out that "Windows 7 is back", before offering customers up to $150 of savings for people buying a PC loaded with Windows 7 rather than 8. Clearly someone at HP wants to push the ageing, non-touch OS over its modern counterpart. It gets worse though! Dear me it gets worse. If you head over to the HP website (you poor thing), you'll find that you're actually only presented with Windows 7 machines by default. There's not a single Windows 8 PCs listed as standard, unless you start customizing the listings with optional filters. Even Android tablets are displayed center-stage, while you have to root around for its Windows 8 offering. OK, so Windows 8 wasn't the finest piece of OS design ever, but 8.1 solved so many of those issues that it's actually pretty great. Certainly, it's not so bad that a hardware company like HP should choose to peddle an ageing OS in favor of it, like XP was promoted over Vista. That time it was justified; this time it doesn't make a great deal of sense.